Learn more about Bellwether’s work by reading our publications, news articles, press releases, and case studies. Human-centered design is an approach to creating solutions for problems and opportunities through a focus on the needs, contexts, behaviors, and emotions of the people that the solutions will serve. For years, it has been used to create and re-create products, services, and experiences such as doors, hospital visits, and breast pumps. More recently, public agencies have begun to use human-centered design methods to define problems, generate solutions, and test them to improve the services that they deliver. Some governments have even created innovation offices that serve as in-house design consultants and train other employees to integrate human-centered approaches into their daily work. Increasingly, designers and public leaders are beginning to apply human-centered design methods to the creation of public policies themselves. 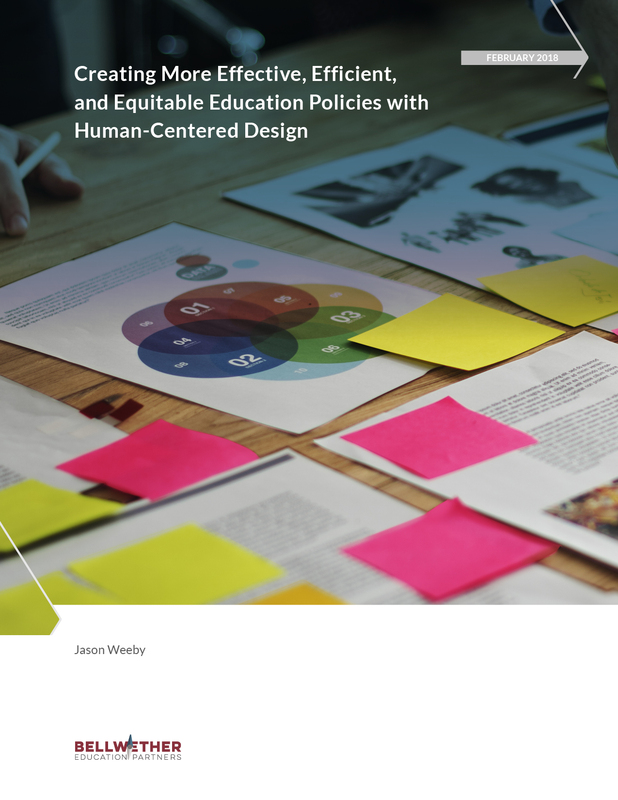 So what would it look like if human-centered design methods were applied to the creation of education policies? Can a process created for products and services in the private sector improve how education policies are created and implemented? Early childhood experts and advocates have long called for increasing the education and training of U.S. early childhood workers, and over the past two decades, policymakers have gradually increased credentialing requirements for teachers in Head Start and state-funded pre-K programs. The 2015 report from the National Academies Transforming the Workforce for Children Birth Through Age 8: A Unifying Foundation essentially endorsed that trend, recommending that states and other organizations build a system that requires and enables all lead educators in early childhood settings to hold a minimum of a bachelor’s degree with specialized knowledge and competencies in early childhood education. In 2017 New America and Bellwether Education Partners brought together experts to discuss the group of educators who are poised to achieve this: lead pre-K educators who are teaching three- and four-year-olds in publicly funded classrooms within early learning centers and elementary schools. U.S. News & World Report -- Community colleges play a key role educating early childhood workers. While there has been extensive debate about mandating degree requirements for early childhood educators, little of this debate has focused on the type of programs early childhood educators are likely to attend, let alone the quality of these programs. It Takes a Community: Leveraging Community Colleges to Transform the Early Childhood Workforce examines the critical role community colleges currently play in preparing early childhood educators and envisions the role these institutions should play in ongoing efforts to transform the early childhood workforce. The 74 Million -- [T]his week, I want discussions about ESSA from our nation’s governors and ideas for progress on guns. But I want to hear about the broader crises affecting too many of our nation’s young people as well. U.S. News & World Report -- We desperately need a new approach to the national gun debate. U.S. News & World Report -- A Trump proposal to punish immigrants who send their U.S.-born children to Head Start is deeply troubling. School districts across the country are reporting difficulties in hiring high-quality teachers, and states are being asked to respond. Our new slide deck, "Teacher Supply and Demand: How States Track Shortage Areas," surveys the landscape of how states track information on teacher supply and demand. U.S. News & World Report -- Providing free menstrual products in middle-school bathrooms is both easy and common sense. U.S. News & World Report -- Should preschool teachers be required to have college degrees? It's a more complex question than you think. The 74 Million -- 2018 will be ESSA’s most important year yet. U.S. News & World Report -- The emerging 'raw water' health trend is silly, dangerous and short-sighted.